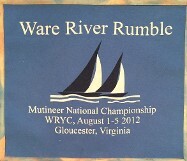 August 6 & 7 - Fleet 1 musters at Ware Rive for the Virginia Governor's Cup. 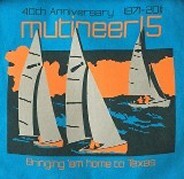 Congratulations to Jerry Thompson and his crew mate Bernard for placing first in the Mutineer fleet this weekend at the Ware River Yacht Club's 47th Annual Governors Cup Regatta. You made the weekly Southern Bay Racing Newsletter. On Saturday racing started at 11:00. 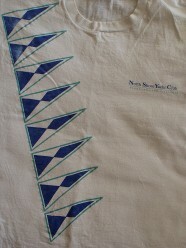 By that time the winds were blowing a consist 12-18 knots with higher gusts and the waves were 3-4 feet. It was awesome! I think everyone will agree that we weren't steering the boats as much as aiming them and holding on for dear life. I saw more bottoms (boat ones that is) on the water than on the beach! On Sunday, I had an early on launch failure with Scallywag, so I packed up and headed out before the fleet returned. So, I am not sure of what happened on Sunday. But I know that there was some strong winds again as I was leaving, and that I ran into some thunderstorms on the drive home not far from the Club. So I'd love someone to fill us all in on the Sunday races. I want to thank everyone who came to the event. I learned alot looking and listening to people chat. I especially want to thank Butch Damon for coming up from South Carolina and crewing for me. 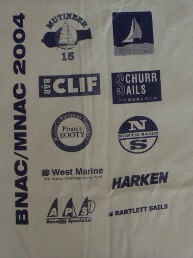 Butch, I learned alot, and Scallywag is going to be a better boat for your suggestions. For those of you who traveled in for the event, please go back to your fleets and talk up this event. 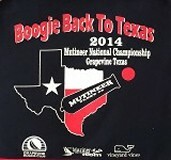 The location is where we are conducting the 2012 Nationals. 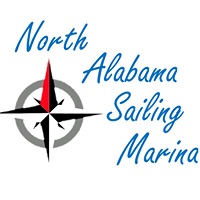 I think we can easily put 20 boats on the line (we had 10 this weekend and I know of at least 2 others that are local and who could attend). 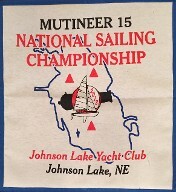 If we put that many boats on the line there is a chance that the Mutineer Champion could also be the Virgina Governors Cup champion. 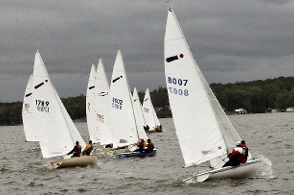 A note to the members from Fleet #1: It would be great to muster the fleet again sometime in mid-September and again around Columbus day weekend. I believe there may be an event at Lake Nockamixon sometime in September, and I'm wondering if there might be a something going on at Kerr Lake around Columbus day? Any thoughts from our members? 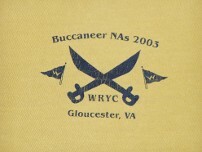 May 2011 - Fleet # 1 will muster at Ware River Yact Club for the 47th Annuaual Virginia Governor's Cup, August 6 and 7. Come join the fun and meet your fleetmates! 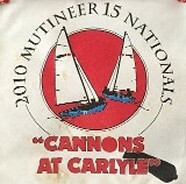 April 2011 - Calling all Mutt Captains, Crew, Wanna-be Mutt Sailors, Wanna-be Mutt Owners,and other assorted Sailing Dreamers from the Mid-Atlantic area!! geography would range from North Carolina, Virginia, Maryland, Pennsylvania, New Jersey, and New York. 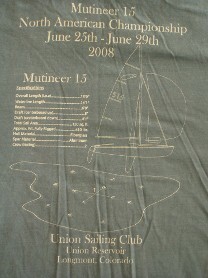 You don't need a Mutineer to join us... just the desire to learn to how to sail one of these fine boats works! would love for a Mutt contingent to join them.